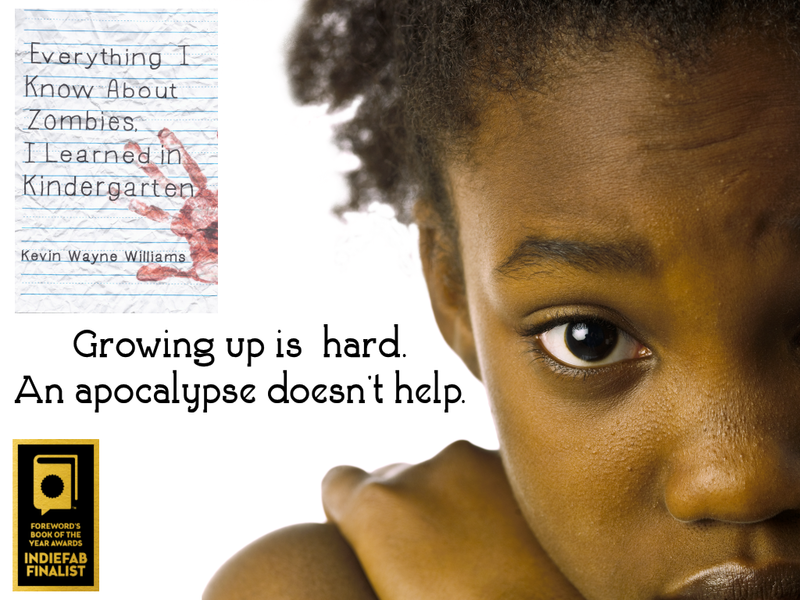 When the apocalypse strikes, nine-year-old Letitia Johnson gathers her five-year-old sister and her sister's classmates and hides them all in a school bathroom. Five days later, after hunger finally drives the small group out of hiding, Letitia finds herself in an evacuated Bronx, desperately improvising a strategy for survival. Distrustful of the small groups of heavily-armed adults that remained behind, Letitia is forced into a sudden, awkward, and clumsy adulthood as she tries to keep twelve kindergarteners together and alive, learning and teaching the new skills they need as she goes. Letitia's toolkit for this adulthood is sparse: vague and contradictory statements from a series of foster parents, poorly understood religious lessons from televangelists, and survival skills gleaned from television shows. When Letitia finally turns to one group of adults for help, she finds that they aren't even doing as well as she is. Everything I Know About Zombies, I Learned in Kindergarten is a horror novel for adults, reminiscent of Lord of the Flies. "For adults, and perhaps young adult readers, it is a stellar addition to the zombie genre, at once page-turning and lyrical ... could be classified as a literary novel. ... the portrayal of kids in this situation could have veered towards sentimentality, but it doesn't because their reactions seem entirely realistic. So Williams' apocalypse is both more harrowing, and more human ... there is plenty here to satisfy genre lovers, which is a testament to how well it straddles the line between gory genre and literature. ...the book gives itself the space to use its characters to explore ideas, important ideas about race, and society, and parenting, about self-sufficiency and inter-dependence and violence ... One to read, even if you’re not a zombie lover. Well-written ... Make no mistake, this isn’t a children’s book about zombies. It’s violent, graphic and more of a horror novel than anything else.